Call 609-339-7016 to schedule your first appointment. If you’re looking for a place to get hearing aids in Burlington, NJ, let Miracle-Ear® show you why we’re America's most recognized brand of hearing aids. Our advantages include being an independently owned and operated hearing aid center that's backed by a brand with more than 70 years of industry experience. We have more than 1300 locations nationwide, and our hearing care specialists will assist you in finding the best solution for your distinct situation. Our hearing aid center offers hearing solutions enhanced with industry-leading innovations, and that includes our GENIUS™ Technology. With GENIUS™ Technology, you can hear natural sounds without the interruption of unwelcome echoes and bothersome wind noises. You can get our hearing aids equipped with Bluetooth®* connectivity so that you have the option to hear music, phone calls, and television with ease. Our center in Burlington will provide you with an easy, painless free hearing test,** and our hearing aids will help you experience a wide array of benefits. From enhancing your ability to understand speech to making sure you can experience your favorite music and movies to the fullest, we want our hearing aids to improve the quality of your life. We’re confident we have a hearing solution that will fit your lifestyle, and our hearing care specialists will be here to help you find it. Call Miracle-Ear to schedule an appointment, or come in today for your hearing test. Brittney has been with Miracle Ear since May of 2017. She started out in the scheduling center and moved up to a Hearing Instrument Apprentice, and just became licensed! 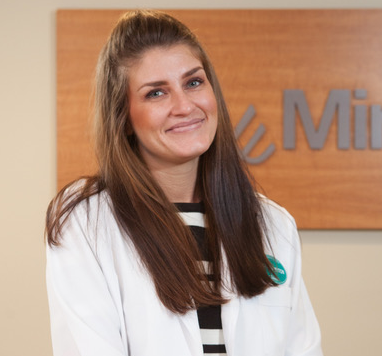 Brittney's favorite part of working at Miracle-Ear is being able to help patients achieve a better quality of life. Brittney truly enjoys getting to know each patient, and feels honored to be able to care for them as if they were her own family.